'Order of precedence' seating is where guests are sat according to their precedence or rank. It is often used at more formal events, such as military and diplomatic events. Order of precedence rules vary a lot between different organizations, so it generally isn't possible to automate the process. However PerfectTablePlan has a number of features that can help the process. You can rank guests by their title. Enter all the titles into the Titles tab of the Preferences window. 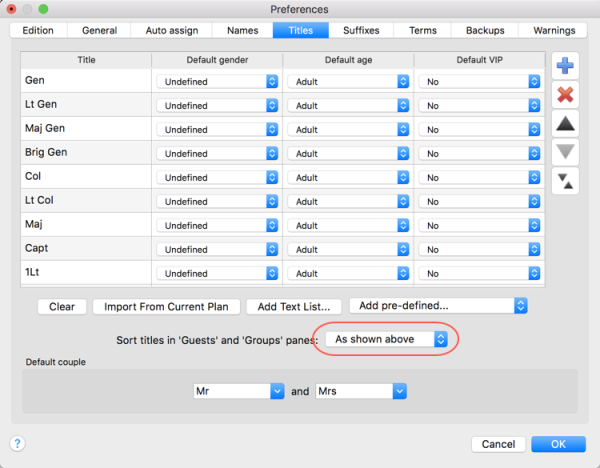 •If you have already imported guests with their titles use Import from current plan. Sort your titles into order using the Up and Down arrows, with the highest ranking at the top. Set Sort titles In 'Guests' and 'Groups' pane to As shown above. Go to the Guests pane and click on the Title column The guests will now be sorted by their title, in rank order. Click again to reverse the order. You can use custom fields to store the precedence of each guest. •Use a custom field of type currency if you wish to use a numeric scale. You can use decimal points. E.g. in a guest has a rank of '7.0' you could give their spouse a rank of '7.1'. •Use a custom field of type selection if you have a limited number of classifications you want to rank by. You can colour-code these classes in the floor plan. 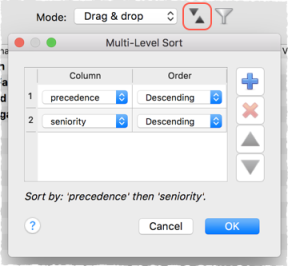 •Use a custom field of type text if to wish to store seniority. You should use a YYYY-MM-DD date format so that the dates are sorted in date order when sorted alphabetically. E.g. 2018-01-07 for 7th January 2018. You can sort the Guests pane by multiple custom fields if there is more than one criteria. For example, you might want to sort by a numeric precedence value and then by seniority date. Click on the Sort button in the Guests pane if you wish to sort by multiple criteria (e.g. rank, then seniority). Select View> Assign seats. You can now drag guests to available seats. If you hold down the Shift key when you drag a guest, it will also drag anyone in their group (e.g. their spouse, if they are a couple).